Ink and Gold: Art of the Kano. Fischer, Felice; Kinoshita, Kyoko. Yale University Press, 2015. ISBN 10: 0300210493 ISBN 13: 9780300210491. In her preface, Felice Fischer writes, “After the early 20th century, the reputation of the Japanese Kano school suffered among collectors and art historians preferred the romantic view of the individualistic, eccentric artist, and who therefore dismissed the Kano painters as academicians and mere copyists. But most of Japanese art has been born of a tradition that seeks to emulate what has gone before, and that honours what is constant and sustaining in Japanese culture. As I hope this exhibition will demonstrate, the Kano artists are significant for the exquisite craftsmanship, rooted in the skill and discipline that enables them to create works of lasting beauty that speak to us to this day”. 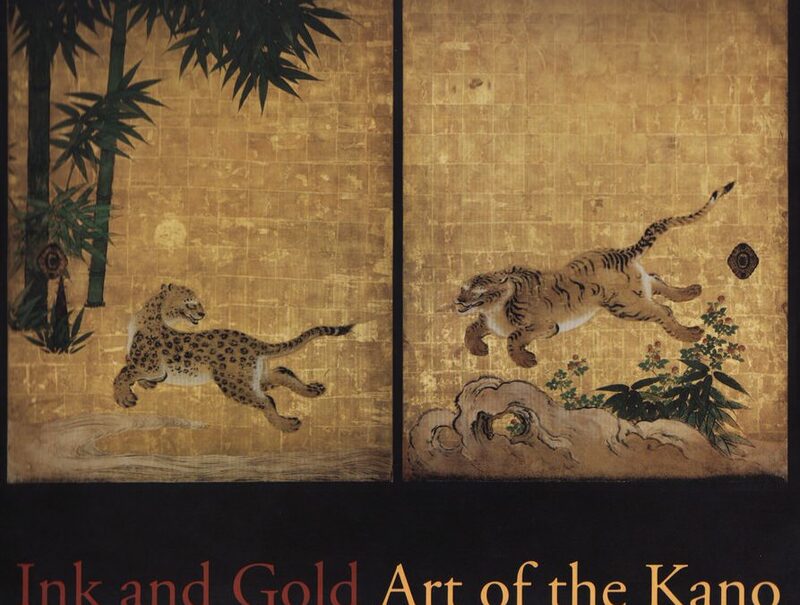 Fischer’s book is a lavishly-illustrated large volume cataloguing the exhibition Ink and Gold: Art of the Kano, which was held exclusively at the Philadelphia Museum of Art. The exhibition was the most important and largest exhibition to be held outside Japan in dedication to the enormously influential Kano school. The book documents an exceptional assemblage of Kano treasures, mostly loaned from Japanese museums and temples, including Innumerable Important Cultural Properties and even a National Treasure by Kano Masanobu. The catalogue focuses on preeminent names and recurring themes within the school. Tanyu (1602-1674) emerges as a hugely influential figure in the Kano world. Tanyu’s works alone counted for one third of the published works. While seminal, this undoubtedly reinforces the existing stereotype of Tanyu’s overpowering shadow preventing many artists from emerging. Perhaps an opportunity was missed to explore later artists of the school and to broaden the scope of the subject matter. It would have also been beneficial to see greater emphasis placed on works produced by Kano school artists in the 100 years before the emergence of a mature Tanyu, when styles were more diverse and dynamic. Nevertheless, the book is highly informative and authoritative. Essays from noted scholars begin the book, while detailed descriptions of each piece of work can be found at the end. Important signatures and seals were placed in the appendix; however, the clarity of these photographs is somewhat inconsistent, as are their print sizes. Overall, the positives far outweigh the negatives. This book is essential for anyone with an interest in Japanese painting. It would also look great on a coffee table.